As a child, I spent much time on Ile Saint-Helene in Montreal, an island comparable to St. Patrick’s Island in Calgary. The island was once host to Montreal’s most ambitious exhibition: Expo 67. While many traces—architectural, infrastructural—endure (Buckminster Fuller’s geodesic dome for example) Alexander Calder’s monumental public art sculpture, L’Homme, is perhaps the most important and significant remnant, and one of the greatest monumental sculptures in Canada. Calder’s L’Homme is situated on an island comparable to St. Patrick’s Island. Strongly influence by this significant work, I wanted to actualize some similar formal strategies in my work Bloom. Inspired by an encounter between the natural landscape of the park and the urban cityscape, large streetlights are assembled organically in Bloom: a seed of the city sprouted among the trees. This monumental sculpture of streetlights blossoms, softly awakening the island and watching over it at night. The monumentality of the lights lies in sharp contrast to the delicacy of the stems, filaments and petals. 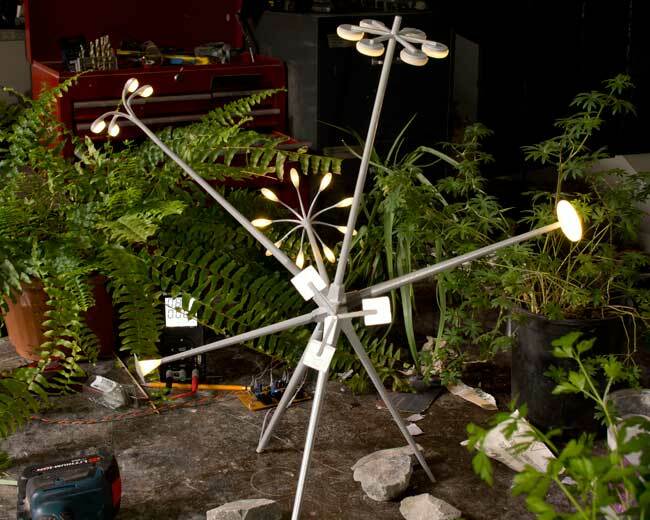 Devices of attraction, flowers and lights create points of encounter and interaction. Bloom has been sited in reference to existing paths throughout the island.Tilted around an elaborate polyhedron, the tall poles extend their extremities in a stellation. Like a burst of rays, the asymmetrically arranged streetlights show all possible directions outward and concentrate strength inward. The projections of light connect the artwork to paths on the island and in turn, create a node or point of focus. By illuminating important routes, the radiant shape helps the urban dweller orient themselves within the city. The sculpture introduces oblique lines in the landscape by folding the existing cityscape. Folding is a baroque strategy that produces movement, tension and exuberance. Bloom can be experienced from afar as a landmark and point of orientation. Equally compelling is the way Bloom is anchored to the ground extending its arms, embracing the sky. The configuration of Bloom’s three supporting limbs liberates the ground in and around the sculpture. Rather than occupying a set area, commandeering the ground space at the expense of such a space’s other possible uses, Bloom instead creates a vibrant locale for congregation, interaction, and possibility in allowing people to make use of the space underneath and around the sculpture. L’Homme by Calder is in much the same spirit; rather than oppressively occupying a massive space, removing other possible uses for such space. Bloom creates a dynamic environment that invites people into its midst. In Montreal, the Calder sculpture has achieved this in myriad ways; throughout the year it is sought out as a destination to meet, relax, or congregate, and it is now host to the incredibly popular Piknic Electronik music festival, which takes place throughout the summer, “under the Calder.” In this way, the sculpture is essential and instrumental to the vibrant music and festivals culture of Montreal; it is more then a work of art, it is a landmark of the city, it is the identity of the city. Just as the abstract limbs of L’Homme play host to diverse interactions, the ubiquitous street lamps of Bloom, and the interaction they create between the natural landscape, the urban cityscape, and the people that populate them, promise to create new, varied, and enriching possibilities on St. Patrick’s Island. Bike and pedestrian paths wind around and underneath and will allow people to interact with the sculpture and see it in detail. On the other hand, from the bridge and opposite shores, one can see the sculpture as a unified entity. For many thousands of years before the invention of the compass, the brightest stars in the sky guided us. Stars show direction and provide an imaginary goal to reach, a point representing the end of a journey. The star has multiple related meanings: direction, expectation, emancipation and light. Bloom can serve the same role for the city; it is a symbol of a promising new beginning for St. Patrick’s Island.